Palme d’Or winner Cristian Mungiu (4 Months, 3 Weeks and 2 Days) returns with this magisterial drama about a young Romanian woman who sets out to retrieve her childhood friend from her “captivity” in a remote Romanian monastery, and soon comes into violent conflict with the archaic strictures of this traditional community. Another insightful study of women on the verge of a nervous breakdown from Romanian director Cristian Mungiu, Beyond the Hills exhibits the same remarkable formal control as his Palme d’Or–winning 4 Months, 3 Weeks and 2 Days. 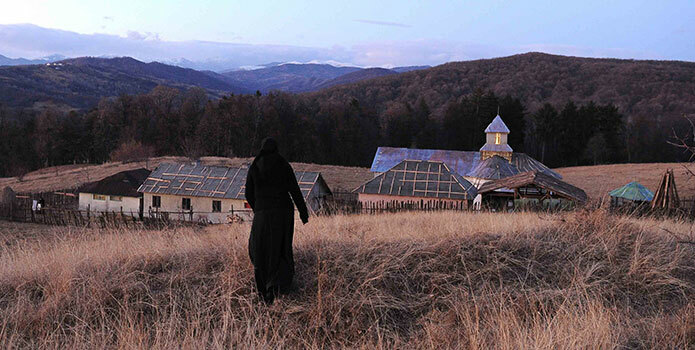 Like that film, Beyond the Hills is a story about women living under an authoritarian regime: a remote Orthodox monastery in the Moldavian wilderness, where archaic beliefs still regulate the life of the community. Alina (Cristina Flutur) is a woman possessed. Returning to her homeland after working menial jobs in Germany, she is determined to rescue her childhood friend Voichita (Cosmina Stratan) from the monastery she was sent to after both girls were ejected from an orphanage at the age of eighteen. Alina’s single-minded resolve excludes any consideration that the docile Voichita might have actually found fulfillment in this austere retreat — and a means of forgetting the lesbian relationship she and Alina once shared, a forbidden love that Alina is eager to rekindle. Standing between them is the unyielding “Papa” (Valeriu Andriuta), the head of the monastic order, who responds to Alina’s aggression with an ever more zealous dogmatism. He soon comes to believe that Alina has fallen prey to demonic possession, and it is his duty to chastise her soul. The only problem is that he fails to take account of the frailty of her body. A brilliant psychological portraitist, Mungiu fully explores the complexities of what could easily have been rendered as a simplistic contest between freethinking and backwards tradition; instead he shows the increasing exasperation of the essentially well-intentioned priest and nuns as they struggle to deal with the unbeareable tension Alina has brought to their community. Beyond the Hills confirms Mungiu’s mastery, and promises a consistently brilliant future. Filmul „După dealuri/ Beyond the Hills”, în regia lui Cristian Mungiu, figurează în selecția Festivalului Internațional de Film de la Toronto (6 – 16 septembrie), considerat cel mai important eveniment de gen din America de Nord. Pelicula a fost inclusă în secțiunea Masters – dedicată celor mai celebrați cineaști ai momentului -, alături de filmele unor regizori precum Michael Haneke („Amour”, premiat cu Palme d’Or), Abbas Kiarostami, Kim Ki-duk, Bernardo Bertolucci, Michael Winterbottom sau Olivier Assayas. Centru mondial al business-ului de film, Toronto adună în fiecare an peste 300 de filme, secțiunea Masters numărând 14 titluri. La ultimele trei ediții, numărul spectatorilor și al oamenilor din industrie participanți la acest festival a depășit 260.000.